TIRANA, Albania (CNN) -- Albania's government resigned Saturday after the deadliest violence in two months of angry unrest but opposition parties and protesters pressed for even more concessions from an embattled President Sali Berisha. The move was Berisha's first major concession in two months of mushrooming disorder in the tiny Balkan state. Clashes Friday left at least nine dead in the southern port city of Vlora, and unrest has escalated in the capital. Speaking after the latest round of unrest, Berisha said the removal of right-wing Prime Minister Aleksander Meksi and his ministers had been agreed at talks with opposition leaders. "To resolve the problems that have been created the leaders of the political parties ... came to the conclusion that the Meksi government will resign," Berisha told state television. Meksi's resignation was later accepted by Berisha, the state-run news agency ATA reported. It quoted a presidential office statement that said Meksi would stay on as caretaker "until a new prime minister is named following consultations with other political parties." Berisha said his Democratic Party, which holds almost all the seats in parliament after disputed elections last year, could form a new Cabinet but would consult opposition forces. It's unclear, however, whether the opposition would sanction any government made up purely of Democratic Party members. Berisha's position was swiftly contested by the main opposition Socialist Party, successor to the Communists who ruled Albania with a Stalinist iron fist for 45 years until 1990. One of its leaders, Namik Dokle, said the only way out of Albania's deep political and economic crisis was to set up a technocrat Cabinet to run the country until early elections. "Berisha has already lost credibility among Albanians, who have called on him to quit too," Dokle told Reuters. Albania, Europe's poorest nation, has been racked by anti-government protests since dubious "get-rich-quick" pyramid investment schemes began to collapse in January, leaving thousands of Albanians penniless. Hunger-striking university students in Vlora danced the macarena and cracked open bottles of sparkling wine on hearing of Meksi's resignation. Celebratory gunshots also rang out in Vlora, where Friday night's shootout between residents and the Shik secret police was the fiercest confrontation in Albania since 40 people died in food riots in 1991. But the students made clear only an all-party commitment to repay investors who sank their meager life savings into the schemes would convince them to end their 10-day-old fast. The hunger strikers apparently have won their demand that the ruling Democrats step down to take responsibility for the pyramid schemes, in which nearly every Albanian lost money. Albanians blame the government for not warning them about the riskiness of the funds. The strikers also are demanding hundreds of millions of dollars lost in the scheme. "If they fail to fulfill our main condition, then we will push ahead with our demands," one student, Arben Rama, said. Students on hunger strike in the southernmost town of Gjirokaster were also unimpressed by Meksi's removal. "We are continuing our hunger strike until all our demands are met. The resignation is a facade," one of the student leaders, Shkelqim Mecoriapaz, said. Berisha is expected to be re-elected unopposed by parliament Monday to a second five-year term as president. In Tirana, riot police were put to flight by stone-throwers in a crowd of some 5,000 demonstrators, defying a police ban to the city's university campus. Witnesses said at least 10 police and protesters were injured in the clashes in the capital, ended when hundreds of riot police regrouped and broke up the gathering by force. Elsewhere, scores of villagers erected road blocks at least five places on the only road connecting Tirana with Vlora 95 miles to the south, reporters said. In Vlora, townsfolk prepared to bury three civilians, one a 17-year-old boy, killed Friday night. During the melee, mobs attacked the city's two-story secret police headquarters, leaving it a smoking ruin, its furniture and files destroyed. Civilians seized a cache of arms and were openly distributing them. 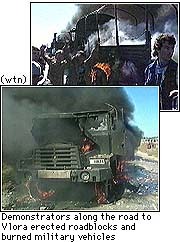 Mobs halted a convoy of soldiers sent to Vlora to respond the violence, setting fire to two trucks, taking weapons from some fo the soldiers and forcing vehicles to return to Tirana. The latest violence prompted renewed calls for restraint from the international community, with Pope John Paul II, France and the U.S. Embassy in Tirana all urging dialogue.